I have a confession to make. I'm having a love affair. A love affair with radishes. I'm sorry, John. I know how hard this must be for you. It was only a matter of time until you figured it out. I'm sure you've seen my eyes wandering in the kitchen, secret trips to the refrigerator, and an over abundance of radishes in our meals. I hope you can find it in your heart to forgive me. Seriously though, these crispy, peppery, ruby colored gems have become one of my new favorite vegetables. And contrary to popular belief, radishes aren't just for salads anymore, they can very well be the star of the dish. As of late I've been obsessed with radish toasts. I think I could eat them every day for the rest of my life, although my arteries probably wouldn't be too happy about that. 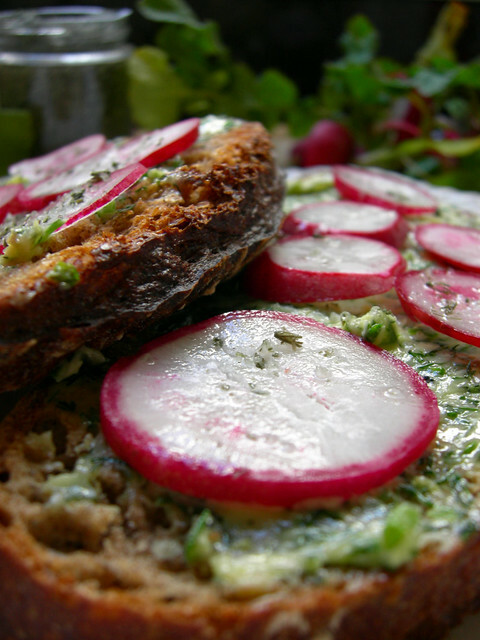 This dish features radishes in their purest form- raw and sliced thin on a slice of crusty, toasted bread slathered with a healthy dose of butter. 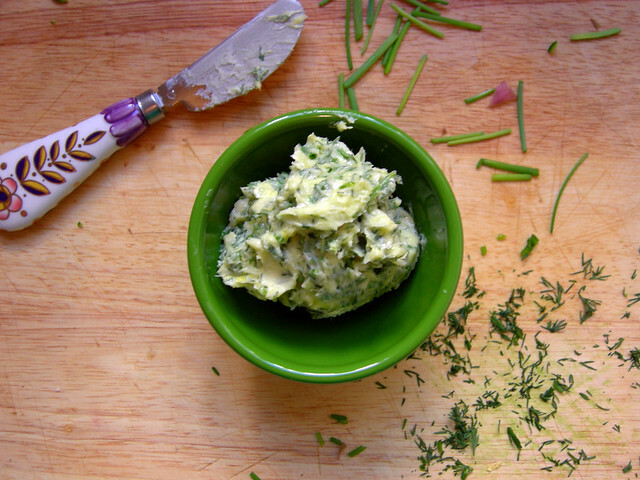 But not just any butter, herbed butter with fresh dill and chives, and the whole shebang is toped off with a sprinkling of lavender salt. I'm already drooling just writing about it. This recipe is unbelievably simple, but the key to the success of this dish is the quality of the ingredients. There aren't many, but if the ingredients aren't the best you can buy it's almost not worth making. So spend the few extra bucks, it will be well worth it. Let butter come up to room temperature so that it is soft and easy to work with. Add chives, dill, and lemon zest. Mix thoroughly until all the ingredients are combined into the butter. Next, toast 4 slices of bread. 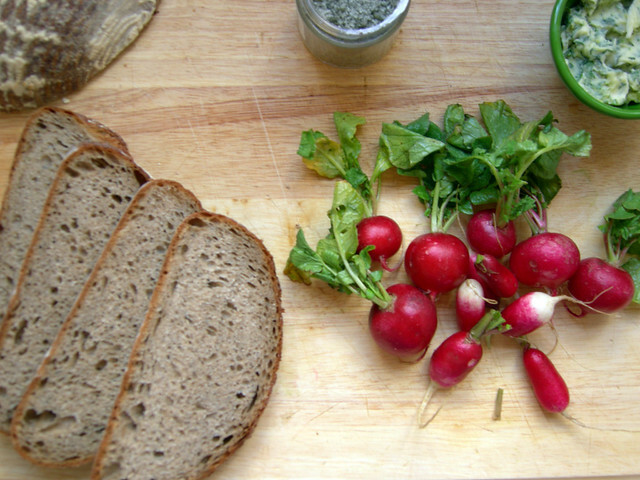 While the bread is toasting, thinly slice several radishes. Once bread is toasted let it cool a bit before spreading on the butter. You want the butter to melt just slightly but not soak completely into the bread. Make sure to use a good amount of butter. Ignore your screaming waistline. 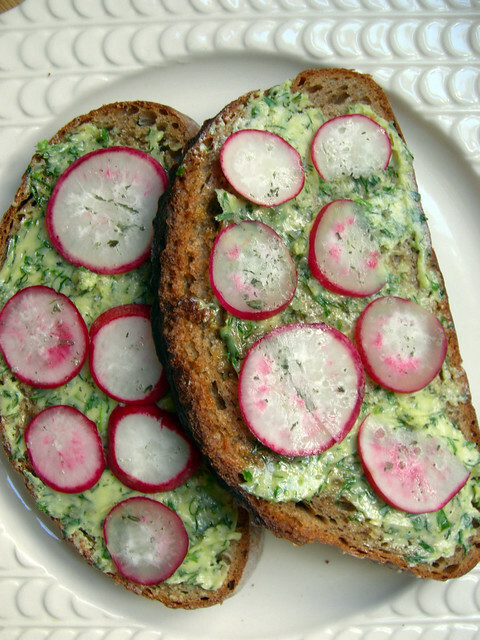 Top buttered toast with a single layer of radishes and sprinkle on a pinch of lavender salt to each piece. Makes approximately 4 large toasts.